Like all Ifor Williams trailers, the P6e and P7e unbraked trailers are designed and constructed for maximum strength and durability enabling them to withstand the rigorous demands of professional users day in and day out. The body panels of the trailers are formed from the same 2mm thick galvanised steel we use on all our plant and commercial ranges. This also goes for the 18mm thick high density plywood platform with a tough resin coating on both sides. The drawbar and axle beam are hot-dip galvanized steel. The P6e has a floor area of 1.21m x 1.98m and a maximum gross weight of either 500 or 750kg. The P7e is slightly longer with a floor space of 1.21m x 2.21m making it ideal for transporting most ATV’s. Recognising the diverse requirements of our customers, we have put together a wide range of variants and options, all realistically priced showing the continued commitment Ifor Williams Trailers Ltd has to giving the best value for your money. The P6e and P7e are unbraked trailers and as such should be used with regard to the Road Vehicles (Construction & Use) regulations 1986, which state that the towing vehicle must have a kerbside weight of at least twice the gross weight of the trailer. Therefore, for example, the maximum gross weight of 750kg will only apply if the kerbside weight of your towing vehicle as stated in the manufacturer's handbook is greater than 1500kg. 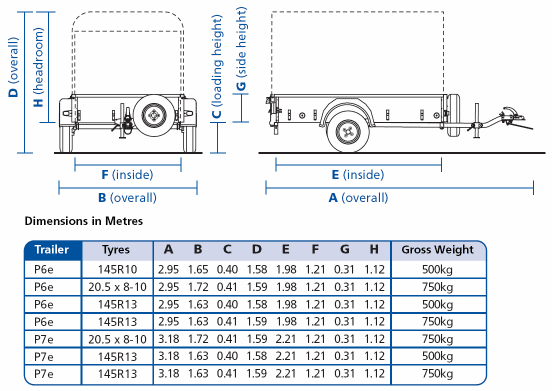 If the kerbside weight is less than this figure, the maximum gross weight of the trailer must be reduced accordingly. The vehicle manufacturer may further restrict this figure by stating a maximum weight of unbraked trailer which may be towed, this must also be taken into account.